Part I: What Educators Ned to Know About the Brain. Introduction and Conceptual Foundation. General Principles of Microstructure and Microfunction. General Principles of Macrostructure and Macrofunction. General Principles of Brain Development. Part II: Linking Brain Research to Literacy Research. Building a Reading Brain Neurologically. Building a Writing Brain Neurologically. Building a Computing Brain Neurologically. Part III: Linking Literacy Research to Brain Research. Building a Reading Brain Pedagogically. Building a Writing Brain Pedagogically. Building a Computing Brain Pedagogically. Part IV: Educational Applications of Brain-Literacy Links. Implications for Educational Policy. Implications for Classroom Practice. Glossary. References. Index. Although educators are expected to bring about functional changes in the brain--the organ of human learning--they are given no formal training in the structure, function or development of the brain in formal or atypically developing children as part of their education. This book is organized around three conceptual themes: First, the interplay between nature (genetics) and nurture (experience and environment) is emphasized. Second, the functional systems of the brain are explained in terms of how they lead to reading, writing and mathematics and the design of instruction. Thirdly, research is presented, not as a finished product, but as a step forward within the field of educational neuropsychology. 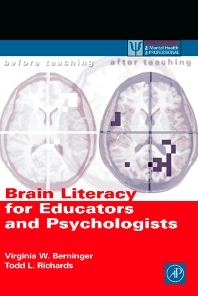 The book differs from neuropsychology and neuroscience books in that it is aimed at practitioners, focuses on high incidence neuropsychological conditions seen in the classroom, and is the only book that integrates both brain research with the practice of effective literacy, and mathematics instruction of the general and special education school-aged populations. Educators, educational psychologists, and learning disabilities specialists.